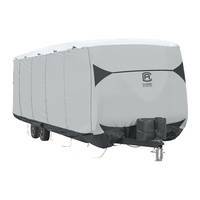 Protect your Travel Trailer from UV, rain, ice and snow damage with a quality RV cover. 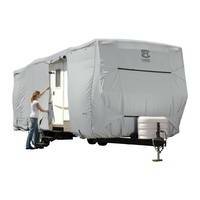 We stock Travel Trailer covers by ADCO and Classic Accessories in quality water-repellent and breathable fabrics. Choose from Tyvek Wind, SFS Aquashed, or PermaPRO for all-weather protection. 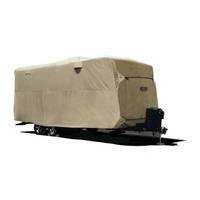 Our Travel Trailer RV covers are strong, durable, and guaranteed to fit your unit. 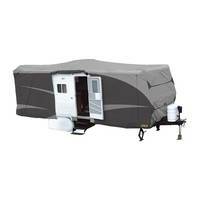 When you choose an ADCO Travel Trailer Cover, you get your choice of a uniquely designed cover with a pleasing appearance. The premium Tyvek Designer Series, the economical SFS Aquashed, and the Storage Lot Cover offer variety and the perfect cover to exactly fit your needs. A family owned company, ADCO has been in business since 1955, focusing on quality and value in their first 20 million covers. Here is an ADCO Designer Series in action, as well as some accessories. Classic Accessories produces exceptionally fitting Travel Trailer covers in their 100% woven polyester materials: PermaPro and SkyShield. Light-weight yet durable, water-repellent but still breathable, these covers are an excellent choice to keep your unit protected from harsh environments. How do I measure my Travel Trailer? To measure for your RV cover, include the bumpers, ladder, and spare tire. The cover is made with an allowance for roof top air conditioners. Using a tape measure, measure the unit from the front to the back, including the bumpers, in the best imaginary straight line that you can. If you decide to go with the dimensions listed in your manufacturer specification sheet instead, it is important to consider whether or not the tongue length is included in the length listed. If the model number of your travel trailer is different from the length listed in the specs, it is likely that the tongue is added to the length. Take 3' away from the length on the specification sheet in order to determine the size of travel trailer cover that you need. Why should I buy from RVCoversDirect.com? 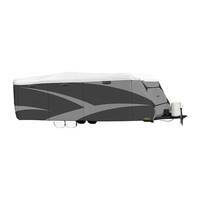 From advanced technology to guarantee your security during transactions on our website to getting your cover to you quickly once it is ordered, RVCoversDirect.com has spent over ten years perfecting the art of selling RV Covers. To us, supplying covers IS an art—we want your Travel Trailer to look good while it’s covered, and we want every part of your transaction to flow smoothly. We deliver a cover that will last, from manufacturers that we trust. We want you to be as happy with RVCoversDirect.com as we are that you have chosen us to serve your cover needs.